Fedde Le Grand and RTL Live Entertainment present a full new show! Don't forget to get your GRAND tickets before Jan 28th in chance of experiencing the last VVAL show of 2016 together with me!! Fortified by a remarkable first edition that has been both intimate and spectacular, RTL Live Entertainment and Fedde Le Grand decided to share this unique experience with a larger number of music lovers. 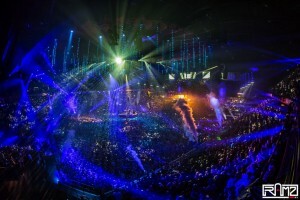 Thus now turning to the Ziggo Dome in Amsterdam for the biggest GRAND edition to date. With the goal being simple: taking down the barriers and breaking all codes of a traditional dance party, GRAND is definitely set to be the most astonishing show of the year. You'll experience all euphoric moments you'd expect of any proper dance night with emotive drops and melodic breaks leading the way. This however is not a traditional rave by any means. Fedde Le Grand and RTL Live Entertainment go out of their way to overwhelm you with the most stunning show elements, giving you a sense of luxury and meticulous care that you have never experienced before at any dance event. Unique in the world, Fedde Le Grand and RTL Live Entertainment push the envelope by creating a full hybrid between the worlds of dance and theatre. Bboys, ballet dancers, singers, actors and live musicians will all play their part in elevating Le Grand's beats to a full-blown experience where you'll fall from one surprise into the next. Prepare to witness the biggest dance spectacle of the world!